Fresco, early 16th century speziale,Castello di Issogne, lower Aosta Valley, Italy. Stefano Rosselli came from a family that was a mixture of artists and pharmacists. 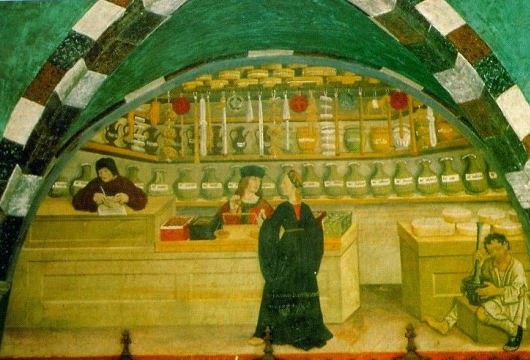 His father Romollo, with a degree from the university at Pisa, was a specialist in herbal remedies (simples). 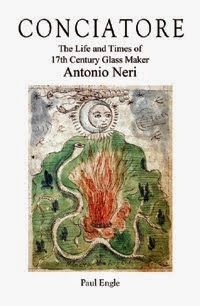 His brother Antonio (Fra Anslemo) worked at the pharmacy of San Marco, directly across the street from the Casino where Antonio Neri would later make glass. Their grandfather Bernardo Rosselli was a painter, a favorite of Michelangelo. Stefano’s daughter Fiametta joined the Dominicans as a nun, and became the famous sculptress Suor Caterina Eletta. A distant cousin was Cosimo Rosselli, who returned from Rome with a small fortune, earned painting for the pope. Biographer Giorgio Vasari noted that Cosimo could have lived comfortably on those earnings had the passion for alchemy not overtaken him.